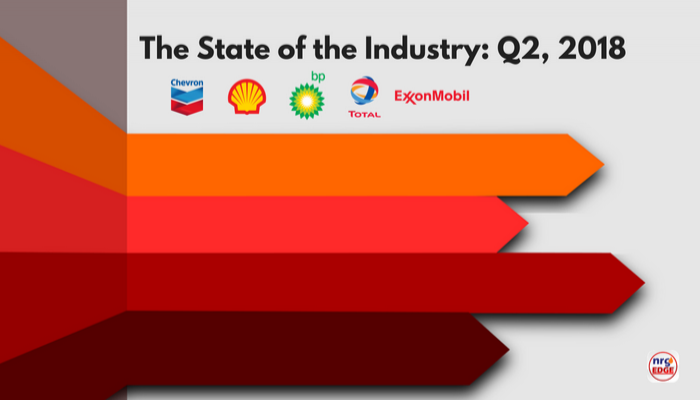 In a quarter where oil prices were at their strongest levels since early 2015, the oil industry largely reported a healthy bump in revenues and profits. Investors and institutions had anticipated this, expecting strong results, but although numbers were healthily in the black all around, not everyone lived up to expectations. The European supermajors once again performed strongest. 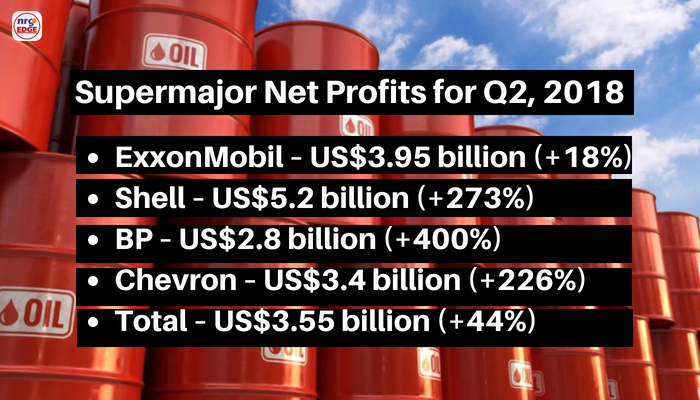 Total, once not even considered a supermajor, continued its streak of impressive results, having eclipsed BP and Chevron in net profits for the third consecutive quarter. With its quarterly oil and gas production rising by 9% y-o-y to a new record high of 2.72 mmb/d, Total expects its strong year to continue, now projecting a full-year upstream growth of 7%, firmly entrenching its place within the Big Five. BP saw a quadrupling of its net profits, shrugging off concerns from investors that its US$10.5 billion acquisition of BHP Billiton's American shale assets would dent its cash flow. The firm said it is on track to return to ‘its former size' by the early 2020s, while making good progress on its financial settlement of the Deepwater Horizon incident. Shell's net profits eclipsed its rival ExxonMobil's for a fifth consecutive quarter, almost tripling to US$5.2 billion. This, however, was below analyst expectations; oil prices averaging in the US$70/b level had investors salivating over strong profits and dividends, but Shell managed to assuage some concerns by announcing a US$25 billion share buyback scheme through 2020. No such appeasement came from ExxonMobil. Net profits did improve by 18%, but nowhere near the 50% jump in crude oil prices over the period. Crucially, upstream production also fell – to 3.6 mmb/d, the lowest level in more than 20 years – while more than US$600 million was spent to upgrade refineries in France, Canada, Texas and Saudi Arabia, dragging down profits at the previously stellar downstream division. ExxonMobil had pre-warned the market of results that would be ‘well below market expectations', but the market still punished the stock, sending its down 3% in the immediate aftermath of trading. Expectations were also missed at Chevron, but oil production rising by 2% and a modest US$3 billion stock buyback mollified the situation. It might have been a mixed session for the supermajors, but the rest of the industry is reaping rewards. Chinese state oil firms reported record profits, as did India. Crucially, Halliburton and Schlumberger also reported strong revenue and profits, sparking hope of the service sector staging a recovery after the past challenging three years. Subscribe to NrgEdge today for the latest news and analysis in the oil & gas industry!